SportCenter’s featured piece Sunday, May 18, will trace the rebirth of roller derby, which peaked in popularity in the early 1970’s and has failed in several comebacks . 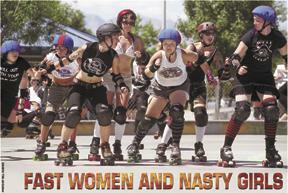 Being from Las Vegas, I’m a little bit familiar with the new incarnation of Roller Derby. There’s actually a Vegas team which receives a little bit of media coverage-mainly from the town’s alternative weekly newspapers Las Vegas Weekly and City Life. Tonight’s ESPN piece, which will be aired during Sportscenter, is sure to feature Brooke Leavitt who plays for Kansas City. Leavitt has only one arm. She lost her other arm in a childhood accident.